Eventer Jonty Evans remains unconscious more than a month after a cross-country accident left him with a serious head injury, but he will be on the minds of his Irish team-mates when they #weargreenforjonty at the upcoming FEI World Equestrian Games in the US. Evans, 46, is in a high dependency ward in the Connolly Hospital, Blanchardstown, West Dublin. He was moved there on June 20 from the intensive care unit at Beaumont Hospital, after his fall on June 3. 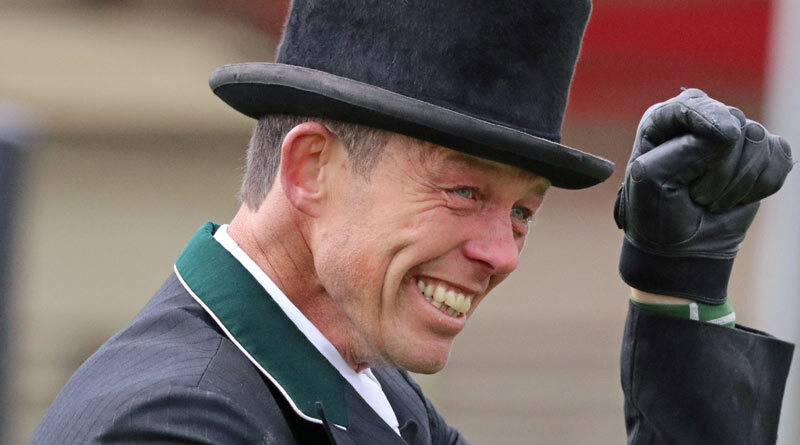 He was riding Cooley Rorkes Drift when at the second element of a water complex in the CIC3* competition at Tattersalls Horse Trials in Ireland. Cooley Rorkes Drift reportedly hit a flagpole coming out of the brush element, and the combination went sideways, with Evans landing on the right side of his head and shoulder. Since his fall, eventers have been encouraged to wear green in support of Evans, spurring the “#weargreenforjonty” movement. A website created by Eventing Worldwide in support of the #weargreenforjonty movement has also sprung up, with profits from the sale of polo shirts and wristbands going to The David Foster Injured Riders Fund, the chosen charity of Jonty’s family. Evans was born in north Wales but represents Ireland, thanks to his grandfather having been born in Northern Ireland, allowing him to hold an Irish passport. Evans and Cooley Rorkes Drift finished ninth individually at the 2016 Summer Olympics in Rio de Janeiro, his first time on Ireland’s Olympic team. Last August, Evans bought Cooley Rorkes Drift, with the help of crowdfunding. He raised £500,000 and ‘Art’ is now owned by the people.